I am hairstyle-impaired. A ponytail is just about the only thing that I have mastered. My hair is also fine and very prone to breakage, so teasing it to get any sort of volume is impossible. I’m also really low maintenance, wash and wear, so even if I could tease and twist and pin my hair into a beautiful coiffure, I just wouldn’t bother. Enter DivaDo. It’s a volumizing hair accessory that involves no primping, pulling or damage to hair. It’s a dome-shaped pice of silicone that has a comb on the underside. To use it, you just part your hair horizontally at the crown, slip in the comb, and brush the front of your hair back over the DivaDo. From blah to Diva in minutes! DivaDo comes in three colors (black, brown, and natural) and two styles. The Brigitte creates sky-high volume perfect for pageants, parties, proms, weddings, or extra pizzazz. The Audrey give a little oomph for a more subtle style and everyday pouf, perfect for moms and other ladies who don’t have the time but want their inner Divas to shine. 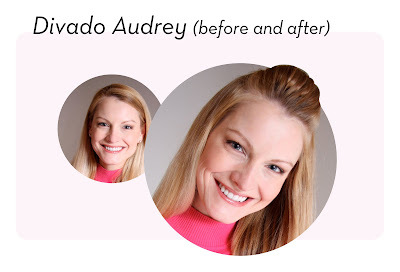 The Audrey worked well in my hair, and helped me to turn my boring half-up-half-down, too-lazy-to-do-my-hair look into something that made it actually look like I took time to style my hair (even though it takes no time at all!) 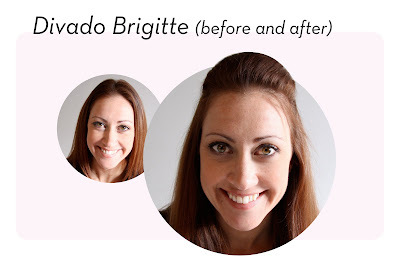 I gave the Brigitte to one of my sisters, who is a model, so that she can spend less time getting her hair styled and more time just being stylish.